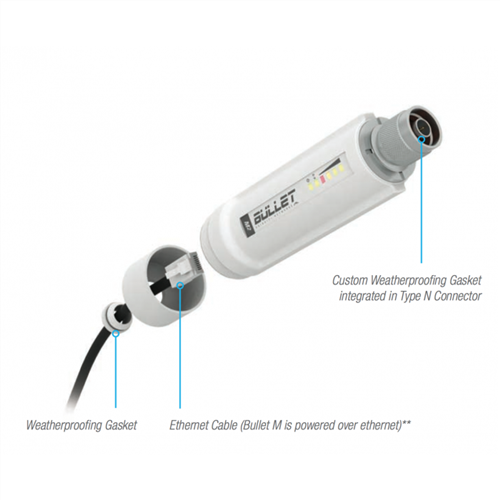 With up to 320mW of power, enhanced receiver design and a 400MHz Atheros CPU, the Bullet M is ideal for long-distance links. 100Mbps+ Real TCP/IP throughput over multi-km links. No host boards, no mini-PCI Cards, no cables, no assembly. With the Bullet, operators can just plug and go. 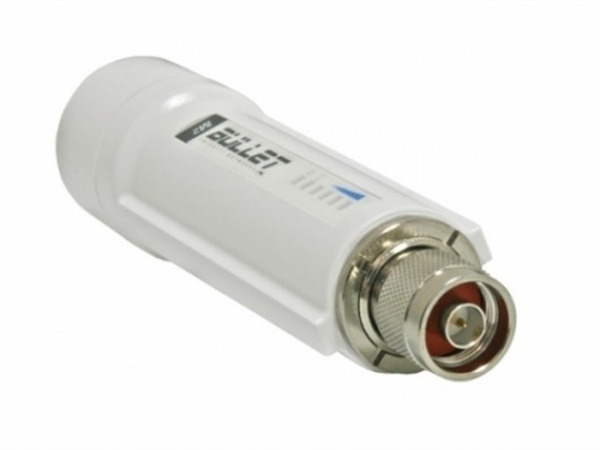 The Bullet M series can be paired with any antenna to deliver 100Mbps+ of real TCP/IP speed over the air. The first cost-effective outdoor device in the world to do so. Ubiquiti Networks introduces AirOS V, the latest evolution in Ubiquiti's AirOS interface. AirOS V maximizes the long range wireless performance of Ubiquiti M Series products. Important Note: When the Ubiquiti Bullet series radios are used outdoors, the N-Type connector must be fully covered with a good coax seal tape to prevent moisture from entering the unit.